In operation since 1986, Moser Engineering has long been a go-to for Mustang axles. Moser prides itself in producing and providing “high-performance rearends, other driveline components, brakes, and suspension parts to the aftermarket industry.” Located in Portland, Indiana, the company boasts that its products are “Made in America,” an important quality for many muscle car enthusiasts. We sat down (virtually) with Marketing Director Jeff Anderson for answers to a handful of pressing questions regarding Mustang axles and more. Why is it important to prepare your Mustang’s rearend for a power increase beforehand, and what does that entail? Read on! 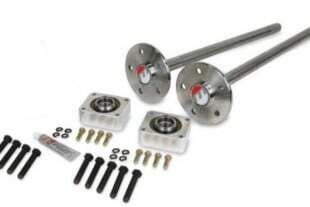 Q: What is spline count and why do I want to upgrade my factory 2005-2014 Mustang axles for the drag strip? A: In simple terms, the axle spline is the raised ridges or teeth at the end of an axle shaft that insert into the side gears in the differential of your rearend assembly. The spline count translates to the number of teeth that circle the diameter of the shaft. Typically, when it comes to most axle shafts, the higher the spline count, the larger the shaft diameter. Increasing the spline count will typically increase the diameter, and often is the easiest way to make a shaft stronger. For example, Ford did this to gain strength for the GT from the base 6-cylinder model. The V6 Mustangs were usually a 28-spline and the GT models were 31-spline. On the street you can often avoid driveline shock because the tires can break loose before axles or driveline components are fractured. However, if you are going to be racing your car at the strip, you need to consider your axles as the traction levels at most drag strips do not allow easy tire spin due to surface prep. The shock to your driveline when launching is much more severe when you have no give in the driveline. These driveline loads have a way of locating the weakest link and often a 28-spline or even 31-spline will not stand up to even moderate power increases with a high RPM launch. Q: What other factors go into making an axle that affect its strength besides spline count? A: There are many ways to make a shaft stronger, but at some point there is the law of diminishing returns. For 8.8-inch housings and differentials, the aftermarket C-clip shafts we manufacturer can give you a strength advantage over OEM because of the upgraded material and custom induction heat treat. With that being said, if you are going to build a strip-only machine with high power levels, then you really should consider upgrading to a larger diameter axle shaft, perhaps 33-spline or larger. This requires upgrading the differential and axles, and a positive axle retention of the axles is usually added at the same time. This is often done by using C-clip eliminators or changing the ends of the housing. Q: To C-clip or not to C-clip eliminate? Why do it and what is involved in the conversion? A: Eliminating the C-clip axles is mandated by most sanctioning bodies for drag racing when the e.t. is 10.99 or quicker in a quarter-mile. These rules exist to try to keep the axles inside the housing if they break. The last thing you want to see is an axle and wheel exit a vehicle during a pass, and someone getting hurt. NHRA learned long ago that there must be some way to keep an axle retained if it happened to break. Positive retention is common in a Ford 9-inch and a lot of Dana-style rears, but the 8.8 needed help and the C-clip eliminator was and still is the simplest fix for a drag-only application. Q: Aren’t all Mustang axles the same? Can’t I just put a set of used Fox-body axles in my S197? A: Unfortunately, you can’t as the Fox-body and the S197 are very different. The differences in axles goes beyond worrying about spline count as the length of the axle also determines the axle flange hangout. This hangout is what allows your brake rotor to align in the brake caliper. If this dimension isn’t correct, you will find it impossible to install your brakes or at the very least have a rotor dragging a brake pad. There are also differences in bolt patterns of the brake hub pilot, so just save yourself the hassle and don’t attempt that swap. Q: What is the most common mistake Mustang owners make when it comes to their rearends? A: I always say building a drag car is like building a house. You can’t start with the roof. You have to build the foundation first. Start with an idea of where you will end up, and build the rear and transmission first before adding power. I know it’s easy to get excited and want to build power first, but often a rearend or transmission and driveshaft breaking can cause a lot of other damage and you don’t want to build the drivetrain twice. Be sure to ask questions, call us and tell us what you are doing, and we can give you advice and guidelines on what you can do safely within the limits of your current rear. Stock-Bottom-End Mustang Proves Three-Valves Can Be Fast!